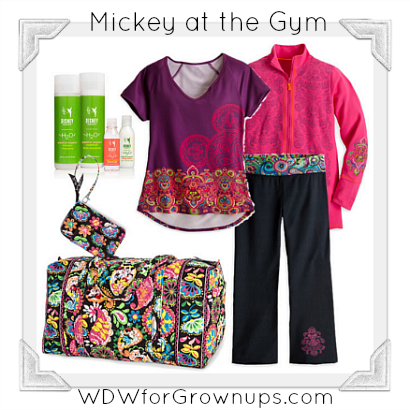 Pack your Midnight with Mickey Duffel by Vera Bradley and head to the gym in this bright and cheerful paisley workout set from the Disney Store that will keep you smiling through every lift and mile. Then when you hit the locker room pull out your H20+ shower set and breathe in delightful scents of the official bath products of the Walt Disney World Resort. After all, everybody loves bath products! The H2O+ fragrance featured above is not the only available option! Check out the DisneyStore.com to see if your favorite vacation scent is for sale. The Midnight with Mickey Collection by Vera Bradley also includes several different shapes and sizes of bags, so if you love the print be sure to check out the whole collection! Do you think a little bit of Disney would help motivate you to get moving? Leave a comment and let me know how you add a touch of Disney to your work out routine! Ok so I may be considered cheap, but if you're really going to use these clothes to work out as I would, they will not last long. As such, I'd rather see them half priced. Then I'd buy two sets insteadvof "saving" them and not wanting to mess them up.